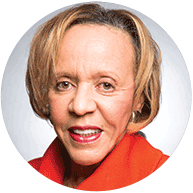 N. Joyce Payne founded the nationally recognized Thurgood Marshall College Fund in 1987. The TMCF is designed exclusively for exceptional students at the nation’s 47 publicly-supported Historically Black Colleges and Universities (HBCUs). In 2008-2009, she served as Executive Director of the National Alliance for Public Trust, a new organization committed to advancing principled leadership in American institutions. She accepted this position following her retirement as Vice President, Office for the Advancement of Public Black Colleges and Council of Student Affairs of the Association of Public & Land-Grant Universities (APLU) in cooperation with the American Association of State Colleges & Universities (AASCU). Before joining OAPBC, Payne was the president of Global Systems, Inc. and was a senior staff member under the Carter administration with the President’s Advisory Committee for Women; President’s National Advisory Council on Women’s Education Programs, and the White House Conference on Families. She taught at the former Federal City College and at George Washington University. An authority on women’s issues in relation to higher education and labor force participation, Payne has published and presented a number of papers on the pursuit of equality for women and African-Americans in higher education. Payne received a bachelor’s degree in speech pathology from the former District of Columbia Teachers College and earned her master’s and doctorate degrees in education from the former Atlanta University. In 2012, she received a Heritage Award from Alcorn State University for her contributions to the School of Agriculture. She also received a Presidential Medal from Delaware State University and has received honorary doctorates from Lincoln University of Missouri, Lincoln University of Pennsylvania, Kentucky State University, and University of the District of Columbia and in 2012 from Central State University. She was inducted into the District of Columbia’s Hall of Fame and the National Black College Alumni Hall of Fame. She served on the Board of Trustees of the University of the District of Columbia for nine years and served for two years as chair of the Board. She serves on the board of directors of TMCF and formerly on the national board of AARP and chaired the AARP Foundation. She served on the distinguished Foreign Service Performance Evaluation Boards at the U.S. Department of State and the U.S. Department of Commerce. She has traveled extensively in Africa, Asia, South America and Europe and recently conducted a fact-finding mission in Singapore; China; Malaysia; Stellenbosch, South Africa and Taiwan. Thurgood Marshall College Fund is the nation’s largest organization exclusively representing the Black College Community. Through scholarships, capacity building and research initiatives, innovative programs and strategic partnerships, TMCF is a vital resource in the PK-12 and higher education space. The organization is also the source of top employers seeking top talent for competitive internships and good jobs. TMCF is a 501(c)(3) tax-exempt, charitable organization. An Organization You Can Trust! Copyright © 2015. All rights reserved. Thurgood Marshall College Fund, Inc.